Elizabeth II became queen on the death of her father, King George VI, on 6 February 1952. But her coronation was held more than a year after the accession, on 2 June 1953. This was in line with the tradition that a celebration like a coronation was inappropriate during the period of mourning for her father. So the Diamond Jubilee celebrations being held this year are actually more reminiscent of those held in 1953 for Elizabeth’s coronation. 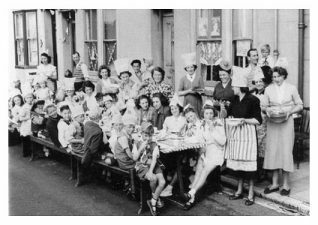 Of course today we can watch the Jubilee celebrations on our TV, but in 1953 only 21% of the population owned one. But everyone could stage a party and these photographs here are just a few examples of Brighton folk celebrating the great day. We would love to read your Coronation day memories. Do you remember any of the parties shown here? Did your road or street put on a party? What goodies did you have to eat? Or were you one of the lucky few who got to see the ceremony on the TV? Please share your memories by posting a comment below. 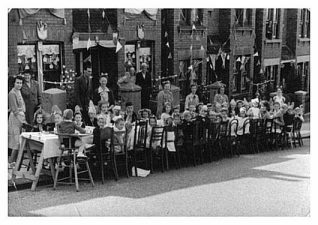 Photograph 1 was submitted by C. West and shows a Coronation street party which was held in Dinapore Street. See the original photograph and page here. 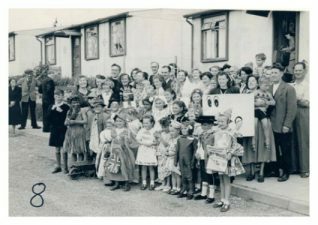 Photograph 2 was submitted by Peter Whitcomb who attended a street party in Dudley Road, where they also had a fancy dress competition. See the original photograph and page here. Photograph 3 was submitted by Marion Goodwin. 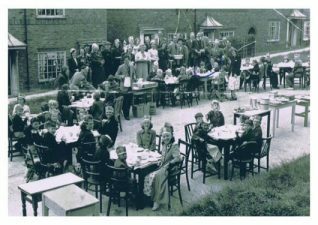 It was taken at a Coronation party in Richmond Buildings. See the original photograph and page here. Photograph 4 was submitted by Dennis Parrett. 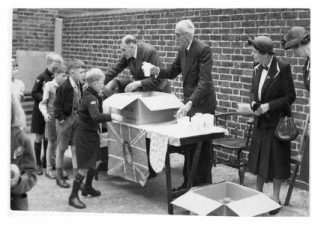 The photograph was taken in the playground of St Mary’s School where Coronation mugs are being handed out. See the original photograph and page here. Photograph 5 was submitted by Joy Pantelli. 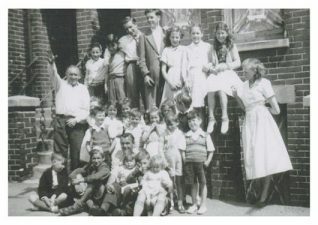 It was taken when neighbours and families of Sussex Terrace gathered together to celebrate the Coronation. See the original photograph and page here. Photograph 6 was submitted by Eric Cook. 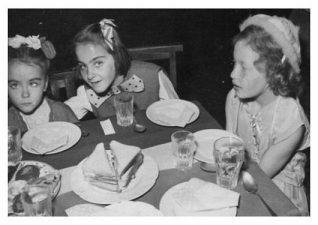 The party, in Wiston Close, a cul-de-sac of prefabs, had cakes, ice cream, jellies, sweets, and paper hats. See the original photograph and page here. Photograph 7 was submitted by Kathy Nichols. Her Coronation party was held in Totland Road. See the original photograph and page here. Photograph 8 was submitted by Robert Dawson. His Coronation party was held in Wiston Road. See the original photograph and page here. 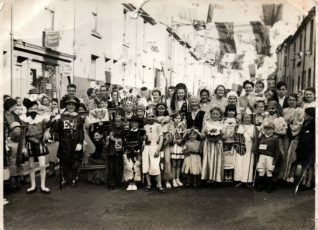 Photograph 9 is of a Coronation party held in New England Street. See the original photograph and page here. 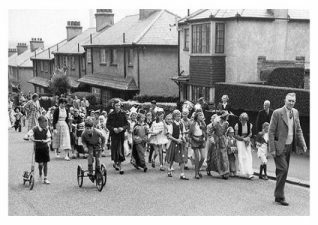 I remember our street party on coronation day in 1953. I was 10 years old. My mum and another lady from Bennett Road went around all the houses collecting for a street party. There were a lot of cakes and blancmange and jelly. Things were still a bit on the austere side then and we still had to use ration books. There was a clown and many other activities which I have long forgotten about. Trestle tables were put on the road and we kids just tucked in to the food. I remember one thing though. I made myself feel very sick after stuffing my face with Peak Freans cream wafers. I can’t stand the sight of them now. They were lovely days which the like of we will never see again. I remember that day very well. I am the one in the sugar-cube costume in photo no.6. They held a fancy dress competition, everybody made a big effort and come up with some great home-made outfits. I won my section. I forget what the prize was but my dad sent a photo of me to Tate & Lyle, and they sent me a terrific book all about sugar.